And so be on your guard. Trickery and deceit comes subtly and cunningly. And in the guise of friendship and concern. It is wise to quietly interrogate proffered friendship and concern from those you hardly know. That is how “mentors” become tormentors. I have heard these words spoken to me, for instance when I am absolutely sure I have heard God’s voice advising a course of action. And God’s advice is often challenging, even senseless, to the rational mind. Because the jewel God requires of us is faith, he may often call us to do something which is senseless to the rational mind. I have spoken these words myself, mainly when I want to be transgressive and not obey what seems to be the Godly course. “You will not certainly die” the serpent says. The life of faith, the life of a Christian, is never easy. It requires a rigorous application of the mind, as well as the heart. So often voices sound certain, knowing, authoritative, as the serpent’s does, with our good at heart. I might have been deceived too. The safest source might be to stick to the truth revealed to you, when bedazzled by competing arguments. And it’s human nature: prohibitions only serve to make forbidden fruit more desirable. I am wondering if there is a parenting application here—the fewer the rules, the less trouble you have with your children. So rather than say no computer games, no sweets…point out the pleasures of reading, the pleasures of health. Parent by winning hearts and minds rather than by rules…which create the instant temptation to break them. Tasty and attractive. The channels for the first temptation. Pleasing to the eye, a masculine temptation; good for food, a feminine temptation?? Eve as the de facto leader of the family!! Eve sounds like a lot of women I know. With sin, comes shame. And the instinctive need to conceal shame. And until one repents, that is the other effect of sin. One hides from the Lord. Skips one’s time of prayer. Prays about tangential things. Reads scripture instead of praying. Allows oneself to get distracted during times of prayer. If blogging is your spiritual discipline, then you blog about things far from where your heart really is. These are all the instinctive reactions of one who continues in sin he will not repent of. It is a good question to address in one’s quiet times. Where exactly am I? The heartbreaking effects of sin. One hides from one’s friend, because your friend would confront you with your sin, and require you to repent. One hides one’s true self from enemies, from the community. You lose some of the joy of friendship. The inextricable connection again between guilt and shame. The next consequence of sin—You blame someone else!! Christ will win the victory but not without pain. The conflict between the sexes in a nutshell. The woman will desire, want (to own, control, possess, have?) her husband. And he will rule over you. Oh dear! The Bible wasn’t written in 2011, was it? Though we still see the Genesis opinion of the roles of the sexes embedded in social mores. It is considered forward and shameful for a woman to propose marriage, for instance, in almost every culture, or to be too forward in bringing this happy state of affairs to pass. And in the vast majority of families, the man is still the principal financial provider, and the vast majority of families are financially reliant on the man’s work and skill. statements. He says that it is always best for men to set “the foreign policy” of families, because women tend to be emotional mother bears when it comes to protecting nest and nestlings, home and hearth. Hmm. There is something to that. God sets a link between work and food in place. And this link is essential for man’s emotional, psychological and, even perhaps, physical health. This curse was partly lifted after the flood, when God sets a connection between seedtime and harvest in place, and was lifted to an even greater extent at Calvary. 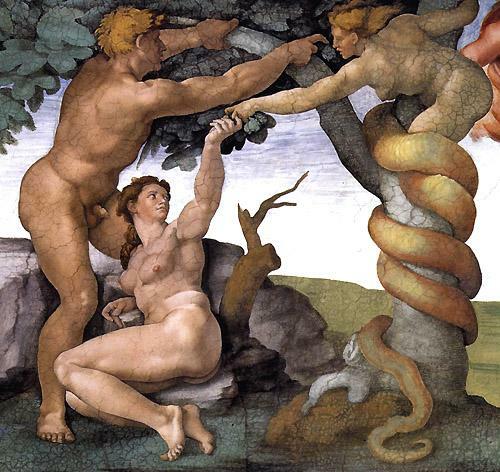 20 Adamnamed his wife Eve,because she would become the mother of all the living. Exiled from Eden for a long season to a life of toil. 1 Adammade love to his wife Eve, and she became pregnant and gave birth to Cain.She said, “With the help of the LORD I have brought forth a man.” 2Later she gave birth to his brother Abel. I have often felt vegetarian may have been closer to God’s will. But given that the good Abel kept flocks, it’s probably okay to be a carnivore—as long as you eat compassionately raised, free-range meat (IMO). It’s costs more, but one’s conscience is at peace—and that’s worth a lot. 3 In the course of time Cain brought some of the fruits of the soil as an offering to the LORD. 4 And Abel also brought an offering—fat portions from some of the firstborn of his flock. The LORD looked with favor on Abel and his offering, 5 but on Cain and his offering he did not look with favor. Why, why, why, did God not look on Cain and his offering with favour? Cain brought some of the fruits of the soil as an offering. There is no suggestion that this was a carefully thought out offering. However, when Abel gave an offering to God, he really gave it!! The first-born, the most precious of the flock in Jewish thinking, and the best and tastiest portions–the fat portions, (hey, those ancient Jews knew something!!). So Cain was very angry, and his face was downcast. The original sin of Cain. When we see God apparently look with more favour on someone else, our first reaction may be to be very angry, and have our faces downcast. However, the righteous reaction is to revise our lives, and to see if there is any sin in our lives, or anything, other than his sovereign will, which keeps his favour from us. And to accept that we are actors in his play, and that he chooses our roles, and so it is rebellion to become very angry, and have our faces downcast. 6 Then the LORD said to Cain, “Why are you angry? Why is your face downcast? 7 If you do what is right, will you not be accepted? Ancient words with modern relevance. Who has not been a bit angry, and had his face downcast when they have seen someone else apparently more blessed by God? And God suggests a way that we too can experience the mysterious thing called his favour. If we do right, we too shall be accepted. Acceptance by God. The best kind of acceptance. The only one which really counts. And God can make things happen. When we are not doing the right thing, sin is ready to pounce on us, and control and master us. Instead, we must control our sinful impulses. Does Cain accept God’s advice? Jealousy can be deadly. So much of man’s endeavour, consciously or unconsciously, is to become one who is envied—for his wealth, success, spouse, kids, looks, lifestyle, whatever. But jealousy can cause deadly harm. Cain killed Abel for no reason other than that he was more blessed and favoured by God. The deadly circle of sin begets sin. Jealousy and sulking beget murder, murder begets insolence and untruthfulness. And when we are wronged—this is the best advice: Relax. There is a just judge. He hears innocent blood cry out. He puts those who wrong the innocent under the curse of his disfavour, the curse of restlessness among other things. And the curse of futility, of barren endeavour, working the ground which no longer yields crops for you. The land in Jewish Old Testament thinking (God’s thinking?) was the good. Being driven from the land was one of the worst things which could happen to the ancient Israelites. The punishment of Cain was “to be a restless wanderer on the earth.” Hmm, I have at last settled down 6 years ago in Oxford, and 5 years ago in our house. We love being rooted, and enjoy the blessing of that. An immense saving in time is one of the blessings of being rooted, having everything set up, and being able to work without the immense waste of energy that moves and being uprooted involves. Thank you, Lord, for roots. Mercy and justice always meet in God. Cain is punished, yes, but because he appealed, he is still under God’s protection, oddly enough to a greater extent that even Abel was. See Mark Buchanan’s take on this http://theoxfordchristian.blogspot.com/2010/06/life-is-unfair-and-thats-okay.html. 19 Lamech married two women, one named Adah and the other Zillah. 20 Adah gave birth to Jabal; he was the father of those who live in tents and raise livestock.21 His brother’s name was Jubal; he was the father of all who play stringed instruments and pipes. 22 Zillah also had a son, Tubal-Cain, who forged all kinds of tools out of[g] bronze and iron. Tubal-Cain’s sister was Naamah. The horrid spirit of Cain, taking a magnified vengeance, 77 times over. Lord, preserve us from this forceful spirit. The story of redemption continues, despite all detours. Covenant with Noah, Genesis 8,9,10.